Now that I've gotten you to plan backwards, it's time to do some prioritizing. Do the important things you need to reach your goals first, and these are not always the things you want to do. I'd rather make some more projects into tutorials instead of filling out my LLC paperwork, but it has the highest priority at the moment. Today's biggest focus: Do the most important thing first! I'm sure many of you are familiar with Stephen Covey's Time Management Matrix. 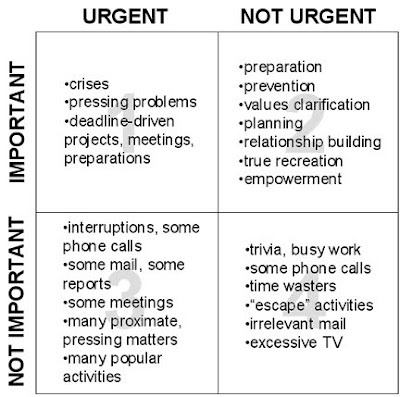 This is a friendly reminder that we should all be spending most of our time in Quadrant 2: important but not urgent. Occasional urgency is ok, but don't let it run your life. Activities in Quadrant 2 significantly and positively affect our lives, the quadrant in which our dreams and goals are. Next week I'll have some great tips to help you prioritize more effectively. Thanks for the tip. I have trouble deciding what's urgent and what's not. May be why I don't get much done. Thanks for your comment! I'm hoping that with a blog series like this people can pick up a few good tips to apply.